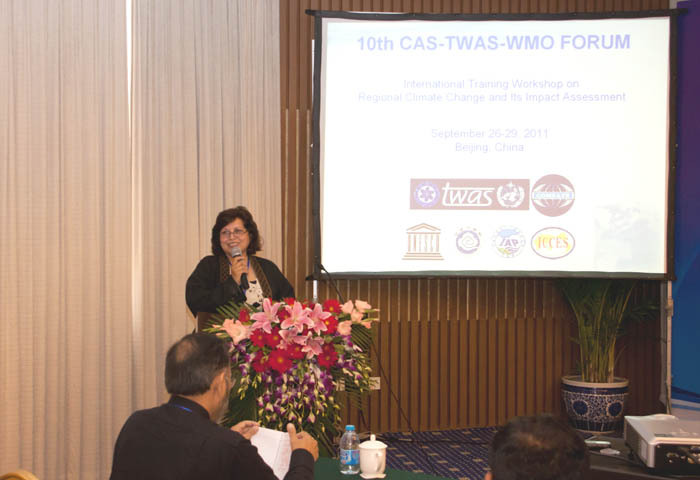 The 10th CTWF International Training Workshop on ‘Regional Climate Change and its Impact Assessment’ was held in Beijing, China, on September 26-29, 2011. 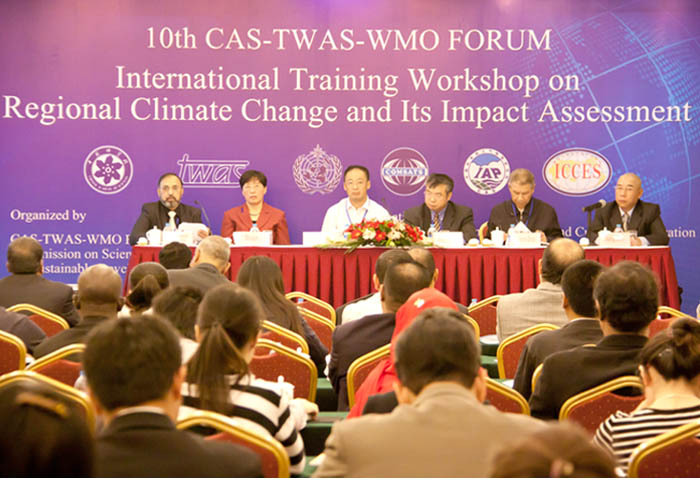 The 4-days Workshop was jointly organized by the Commission on Science and Technology for Sustainable Development in the South (COMSATS) and CAS-TWAS-WMO Forum on Climate Science (CTWF). 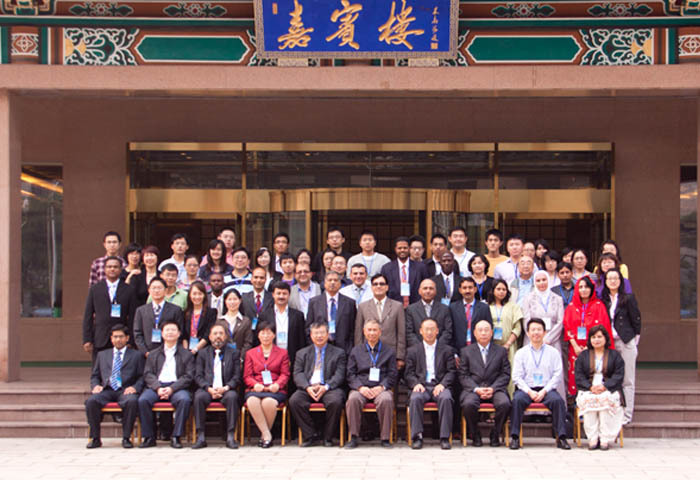 The United Nations Educational, Scientific and Cultural Organization (UNESCO); Ministry of Science and Technology (MOST), Government of China; Chinese Meteorological Administration (CMA), China; Institute of Atmospheric Physics (IAP), China; and International Center for Climate and Environment Sciences (ICCES), China, also co-sponsored the event. The rationale of organizing this workshop was based on the need to understand past experiences of climate change from both regional and global points of view to reveal the multifarious consequences of the phenomenon. To achieve this end, the workshop aimed to reinforce the scientific capacity of the developing countries relating to the understanding of climate change impact and to develop international linkages among the participating researchers and their institutions. 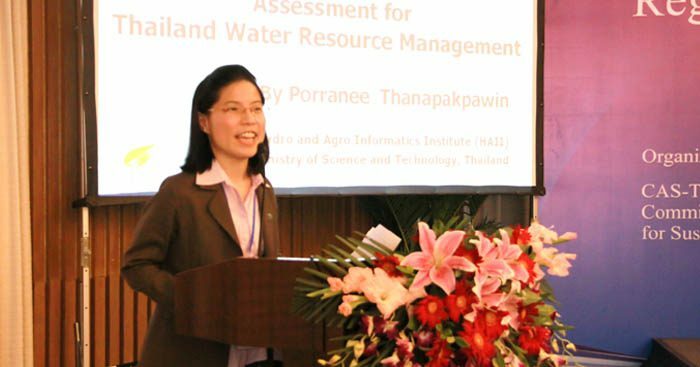 The proceedings of this 4-days workshop encompassed various topics relating to the: i) Facts of Regional Climate Changes and the Detection Techniques; ii) Impact of Climate Change on Regional Water Resources; iii) Impact of Climate Change on Agriculture and Ecosystem; and iv) Regional Climate Models and their Applications for Climate Change Studies. The Deputy Director IAP, Prof. Jiang Zhu (also a member of CO MSATS’ Technical Advisory Committee) chaired the Inaugural Session of the event. During his remarks, Prof. Zhu highlighted the importance of the Workshop’s theme and welcomed the distinguished guests and participants. Messages from the President Chinese Academy of Sciences (CAS), Executive Director TWAS, and Executive Director COMSATS were also read out on the occasion by Mr. Jinghua Cao, Deputy Director, Bureau of International Cooperation, MOST, China; Ms. Shuqin Fu, Director, TWAS Regional Office for East & Southeast Asia, CAS, China; and Mr. Tajammul Hussain, Advisor (Programmes) COMSATS, respectively. 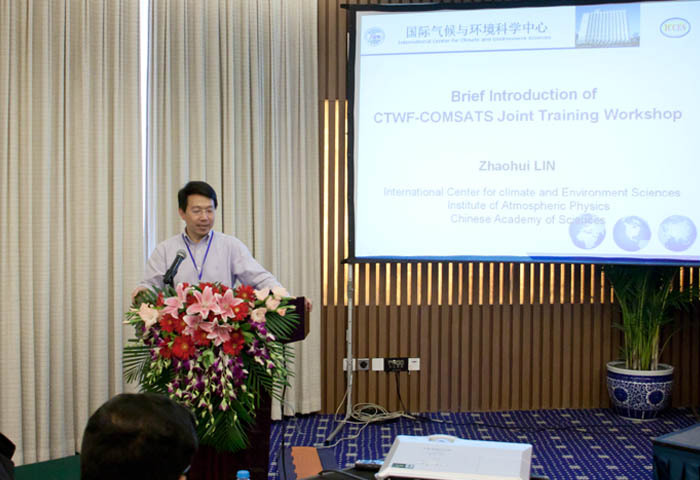 Also attending the Inaugural Session, the Executive Directors of CTWF, Prof. Huijun Wang and Prof. Qingcun Zeng, appreciated the efforts made by the collaborating organizations holding the Workshop and hoped that the event would generate a better understanding on climate change and relevant adaptation and mitigation measures. 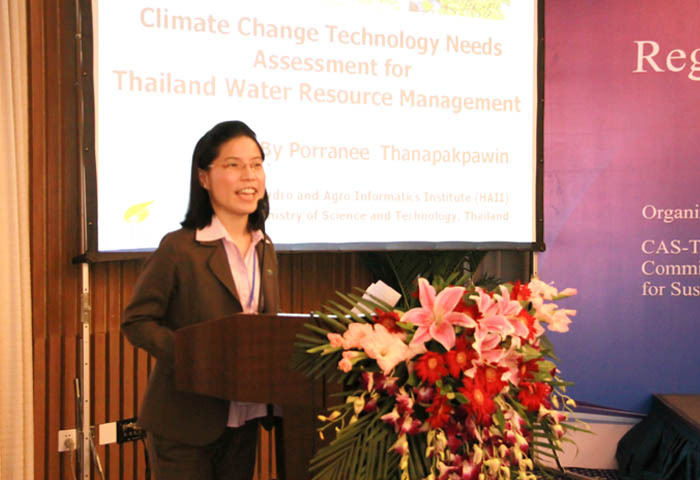 The Workshop comprised of 29 invited lectures and presentati ons on various topics of current interest related to its theme, and included visits to the CMA’s National Climate Centre, Beijing Climate Center, Huafeng Audio & Video Center, and China Meteorological S&T Exhibition Hall, as well as ICCES/IAP. Experiences regarding climate change specific to various regions and countries, including, Indo-china, Bangladesh, China, Pakistan, Jordan, Malaysia, Uganda, etc. were shared. Impact of various weather conditions were evaluated to gauge their long-term effects on various aspects of human life that include, food security and water resource management, geography, and health, aimed at suggesting ways and strategies to better monitor them in the future. Various regional climate models, ICTP RegCM4, PRECIS, ECHAM4 GCM, HadAM3P, WRF Model, RegCM3, etc. were also taken into account. A total of 63 professionals and students from 14 developin g countries attended the Workshop. The participants and institutions represented belonged to Ghana, Sri Lanka, Thailand, Pakistan, Malaysia, Nepal, Mongolia, Uganda, Iran, Egypt, Bangladesh, Vietnam, Jordan and China. Apart from Mr. Tajammul Hussain, Mr. Farhan Ansari, Assistant Director Programmes, represented COMSATS Headquarters while Dr. Shahina Tariq represented the Department of Meteorology, COMSATS Institute of Information Technology (CIIT). The event resulted in enhancing South-South Cooperation in the field of climate sciences and strengthening networking among scientists of developing countries, in general, and COMSATS’ member countries, in particular.